Join Dr. James Cox for this special hands-on demonstration webinar of live treatment protocol demonstration as the protocols relate to the ICD-10 code classifications. You may also ask questions throughout! Blog #5 - Nutrition In Treating Disc Degeneration, Disc Herniation, And Spinal ArthritisICD-10 Coding of Disc Classifications with Drs. 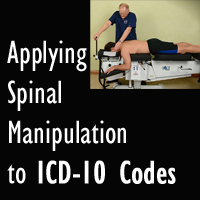 Cox and ArkfeldICD10: Differentiating and Coding Disc ClassificationsLIVE Webinar on January 25 with Treatment Demonstration Cox Technic webinar with Dr. Cox on January 25 focuses on Cervical Spine.